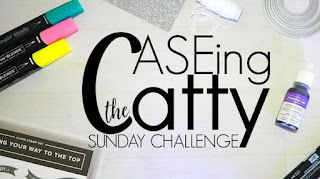 Hello and Welcome to another Sunday Night Blog Hop Caseing the Catty. 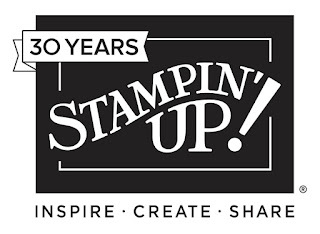 Our challenge is all about finding inspiration in the projects illustrated in the pages of our Stampin' Up! catalogues! This week, our inspiration comes from the fabulous Sale-a-bration catalogue. This little catalogue FULL of free rewards for you is also choc full of fabulous ideas and projects!! 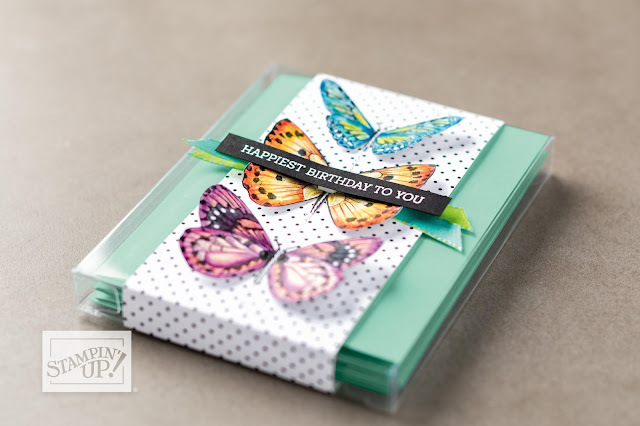 I've been inspired by this lovely little butterfly covered acetate box on page 9. 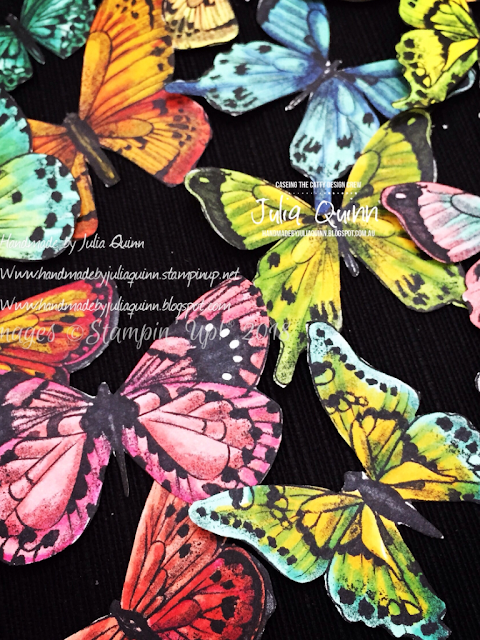 My starting point was to colour in the awesome butterflies on the FREE Sale-a-bration Botanical Butterfly DSP using my Stampin' Blends. I used the illustration in the catalogue as my starting point, and then just had fun with blending colours together to see the results!! They were all then fussy cut and ready to go onto cards!! 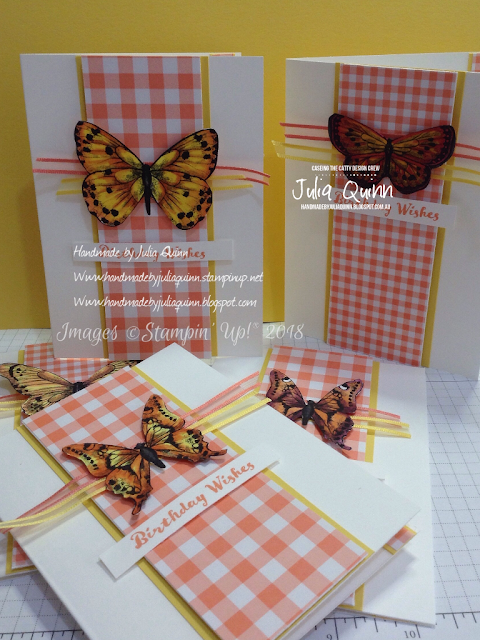 Basically I coordinated some of the super sweet Gingham Gala DSP and one other cardstock colour for each butterfly. 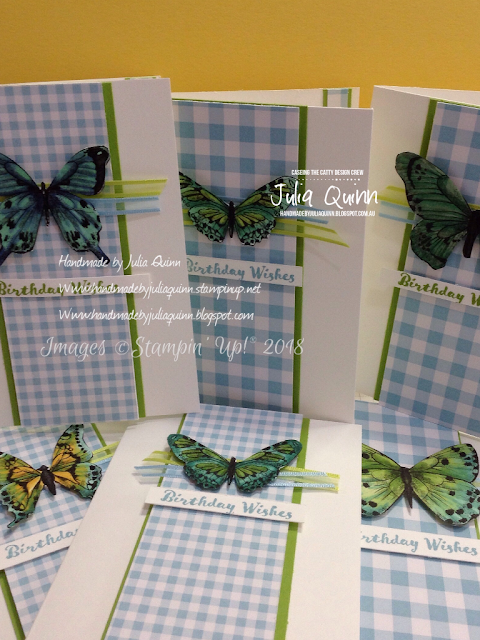 Because there were so many beautiful butterflies on the paper, I had quite a lot of cards to create!! This has given me an awesome start to my birthday card giving this year! 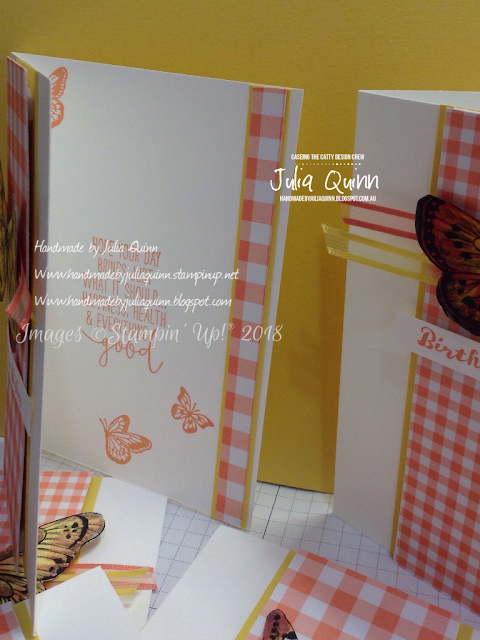 Following the inspiration from the catalogue image, I've also added some of the Sale-a-bration FREE ribbon which coordinated beautifully with the DSP and Butterfly colours. 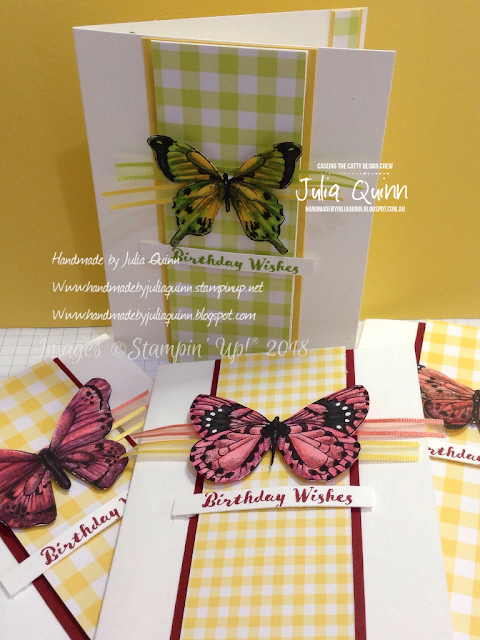 Each of the cards has a very simple continuation of the front colours and design on the inside of the card. 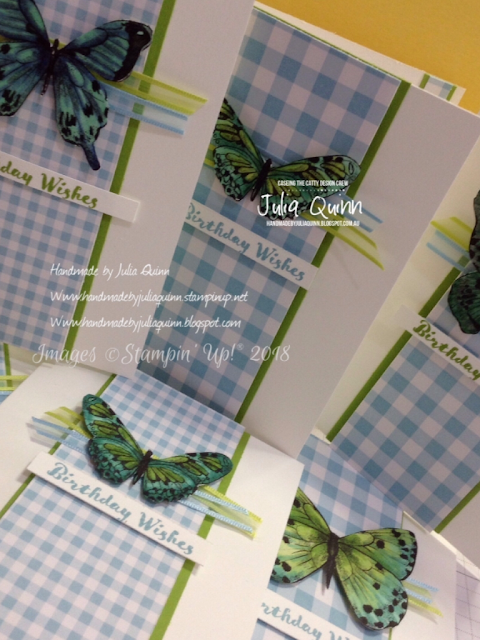 I've used Beauty Abounds, Special Celebrations and Itty Bitty Birthdays for my stamped images and greetings. 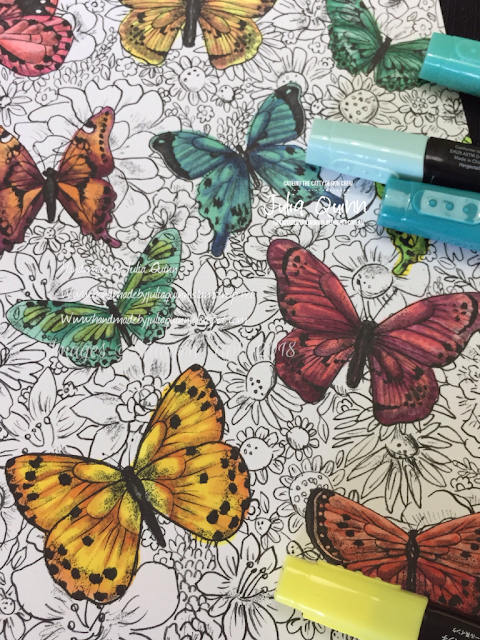 It's amazing what a little quiet afternoon of colouring created!!! 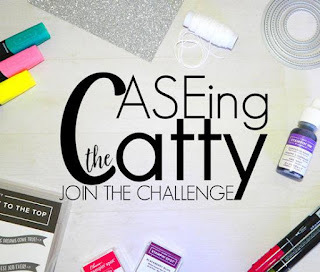 I hope you've been inspired to get creative using the Sale-a-bration catalogue!! 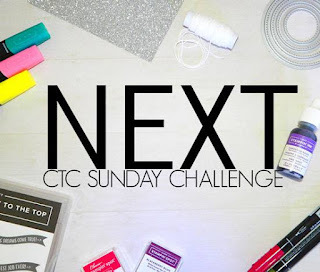 Please join in the fun by adding your project to the lineup on our facebook challenge page. 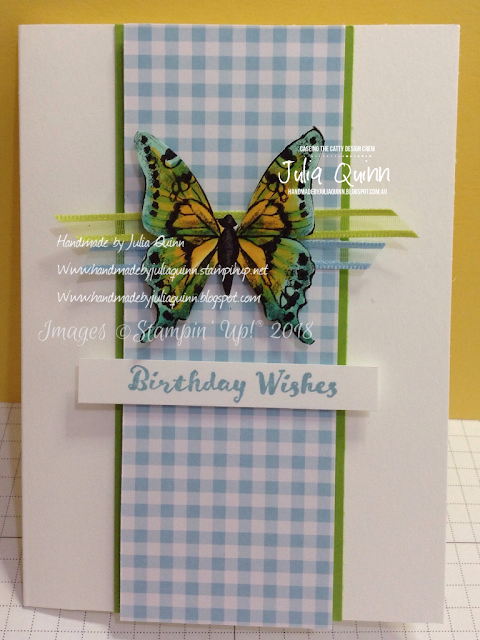 Up next on our Sale-a- bration hop is the lovely Michelle's Sale-a-bration inspired card!! I think I need to go and do some colouring! 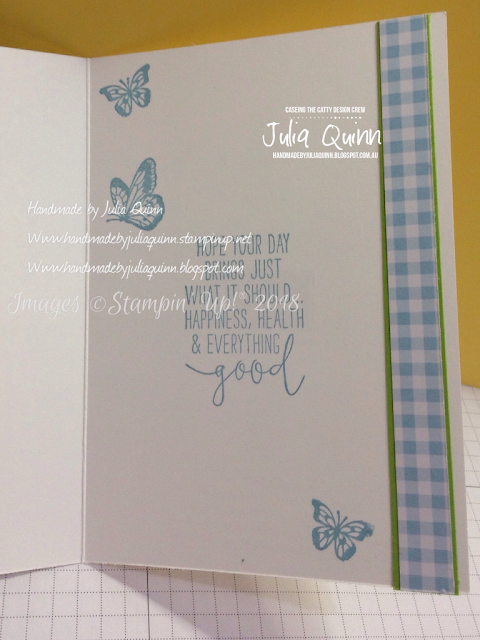 I love the butterflies combined with the Gingham Gala DSP. Wow, your butterflies are stunning, Julia. 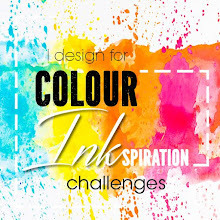 Love your colour combos and the cards you made with them. 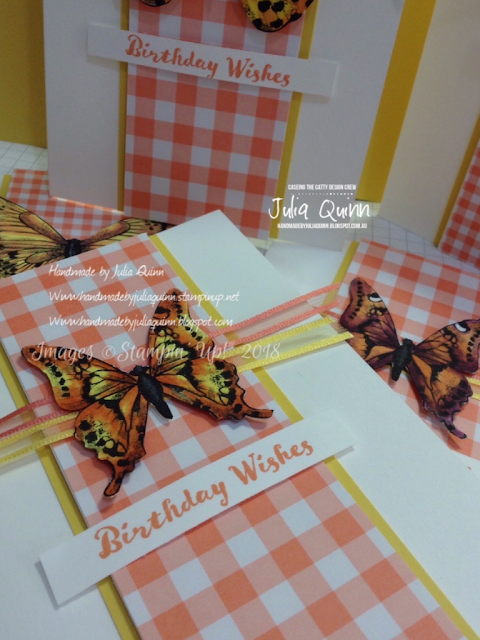 These are really lovely, Julia! You've coloured the butterflies so well, and I love how you've kept the ret simple to let them shine. Beautiful colouring Julia and beautiful cards. All the colours look fabulous together. Thankyou so much PETA. 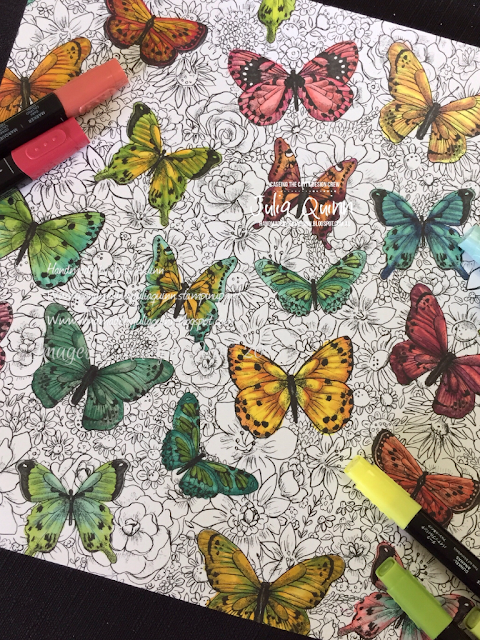 Those butterflies are just gorgeous to colour!! 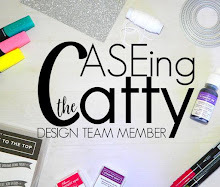 Have you seen these Sale-a-bration projects?